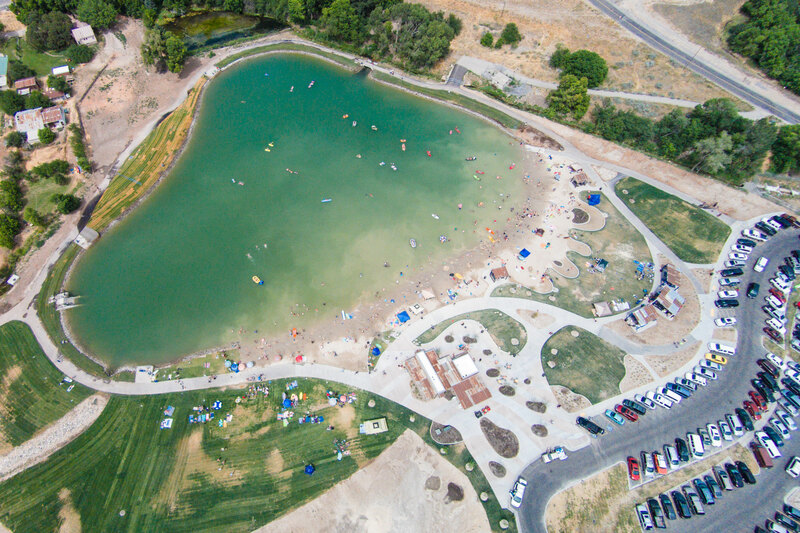 Wayne Bartholomew Family Park is located at 1090 South 2900 East and is open from dawn to dusk, Sunday through Saturday. Parking permits are required at Wayne Bartholomew Family Park May 1 – September 30. Permits are not required October 1 – April 30. Beginning April 1st, free annual permits for Springville residents are available at the Civic Center, Clyde Recreation Center and the Parks and Recreation Office with photo ID and proof of residence. Form to obtain parking permit must be filled out and signed by person 18 years-or-age or older. One permit per household can be issued. Snack Bar Hours: Snack bar may be open about May 24th. Monday – Thursday: 11 a.m. – 6 p.m.
Friday – Saturday: 11 a.m. – 8 p.m.
All pets must be leashed and controlled at all times in City Parks. Maximum leash length is 6 feet. You must also clean up after your pet and dispose of their waste. No dogs or other pets are allowed on the beach or in the water at Wayne Bartholomew Family Park. Volleyball and ring toss equipment is available to check out at the concessions building. Equipment will be checked out on a first-come-first-served basis. There is no charge and supplies are limited. From I-15 take exit 260. Drive east until you reach the roundabout at 1300 East/Canyon Road. Turn right at the roundabout and follow Canyon Road until you reach 2900 East. Turn right and you will see the park to your right. To reserve online you must do so at least 3 days before desired date. Otherwise, call (801) 489-2770 (Monday-Friday, 8 a.m.-5 p.m.) to make a reservation. Same day reservations will not be taken. Time blocks are: 10:30 a.m. to 1:30 p.m., 2 p.m. to 5 p.m., 5:30 p.m. to 8:30 p.m.
Springville City Resident/Homeowner: One who lives within Springville City city limit boundaries and pays property taxes to Springville City. OR, one who lives within Springville City boundaries and occupies a rental property from a landlord. One pass per household is allowed. Landlord of Residential Property: One who may or may not live in Springville City boundaries but pays property taxes to the City. Landlord is entitled to ONE pass regardless of number of dwellings owned. Business Owner: A business located in Springville City limits, and the building is owned by the business owner/landlord who in turn pays property taxes to the City. Must provide proof of ownership. One pass per business owner, regardless of number of business properties owned. Springville residents who live in the vicinity of the park will be given parking passes to park on their residential streets. Park patrons must not park in the residential areas near the park. Parking is enforced May 1st through September 30th. No complimentary passes will be given to those who reserve pavilions. Parking fee for non-resident is $10 per vehicle per day. Fee is paid via phone or internet. Signs are posted with the phone number and website.